*Future Sally’s Time was originally presented over two sides of the vinyl LP, and so there is an abrupt stop and start in the middle of the track exactly as it appeared. This LP has been a rather illusive David Murray recording for me. In fact adding it to my collection (as far as I am aware) now completes a set of commercial recordings by Murray as leader or co-leader. This is certainly his rarest release. It has been long out of print, second hand copies hardly ever come up for sale, and dealer prices are some what inflated. But thanks to the generosity of a fellow Murray fan I now own the final piece of my Murray odyssey. Thank you so much, Dale. The record was also worth the wait, because Murray’s performance does not disappoint. This was a trio of musicians that played together, but not what one could consider a stable band. The recording is one of the few to feature jazz and cultural critic Stanley Crouch on drums soon after his arrival in New York. He was to make a much bigger name for himself as a rather opinionated journalist, but he has always been rather self-effacing about his drumming skills. I think he acquits himself perfectly well here. 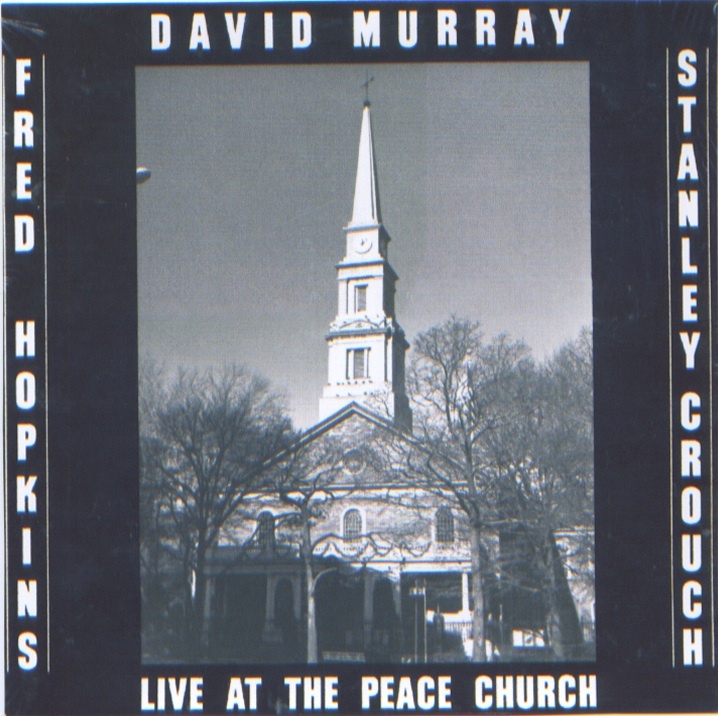 Although Murray is the strongest player, with Fred Hopkins in rather more subdued mood than usual, Crouch gives interesting percussion fills, and a clear grasp of the music. He had been a mentor and teacher to Murray in California, and his role is equally supportive here. Although the sleeve notes make the point that the approach of musicians on what the writer calls “the New Jazz, Avant Guard Jazz, or Free Jazz” scene was away from the traditional role of leader and sidemen, Murray is credited as author of all the themes here, and dominates throughout. There are no alternating solos here, with Murray improvising strongly throughout a number supported by Hopkins on plucked and bowed bass and Crouch’s fills. Hopkins does have some solo space on ‘Future Sally’s Time’ but he remains uncharacteristically introverted. His playing circles downwards like water running out of a plug hole. The statement of themes is far more diffuse when compared with recordings of the same pieces made within a few months of this date, but his often plaintive playing dominates. I struggle with musicological comparisons, but just jumping between different sections of different tracks suggests that they are more part of one approach to improvising ideas than distinct as themes. As I’ve noted in an earlier post, Low Class Conspiracy was an oft used phrase in the Murray lexicon at the time, and it seems particularly associated with projects involving Crouch, so I’m guessing he coined the phrase. Here it is used for the name of one theme in a longer improvisation, is a very different performance from that on the LP of the same name, and is run into ‘Turquoise Cement Flower’. I can’t actually tell off my first few listens through where one stops and the other starts. The surreal title of the latter part wasn’t used again, and the style of titling is notably different from the far more personalised approach Murray usually took, even within the titles on this LP. Does that suggest the name didn’t come from Murray? ‘Future Sally’s Time’ is somewhat closer to his usual personalising approach, but still has that sense of abstraction. I’m not aware of another recording of ‘Beauty from Elsewhere’, and again there doesn’t seem to be the strong writing common to almost all the rest of his work. This is a far more pensive performance than his other records of the time, with far fewer of the usual gospel ecstatic moments that Murray would become associated with, and far less of the flash than one finds on contemporary concerts made in Europe. The title of the album is significant, not simply because it indicates that the music was recorded at St Mark’s Church in Manhattan, but that this fact reveals something interesting and significant about the jazz scene in New York at that time. During this period Murray and his fellow musicians are often referred to as members of the ‘loft scene’, and music like this termed ‘loft jazz’. The term, of course, referrers to the reuse of industrial spaces as domestic residences and artistic venues outside the mainstream of commercial live music. Murray played extensively in these venues, and a number of his early releases were recorded at places like Ladies Fort and Rivbae, and Crouch ran his own venue from the loft he lived in. Many musicians, though, have expressed their annoyance at the term ‘loft scene’ because they felt it inaccurately limited an understanding of the spaces in which the new music was made; and fighting against limitations on understanding were a central tenant of musical practice of this time. The Peace Church, though, was one of a whole series of equally important venues outside the lofts where musicians played. While the postwar jazz clubs may have had very little space for the new jazz, these venues were integrated into other cultural activities and neighbourhood politics. The Peace Church had been a significant location for anti-Vietnam war activity and other radical political causes in the 1960s, and these ideas are embedded in the notion that it was also host to creative musicians in the 1970s.